DermAssist Series 161 Vinyl Exam Gloves are constructed from a soft, flexible PVC polymer that is secured to a polyurethane interior. They are extremely comfortable and available in 4 sizes (average length of 9.5 inch); small, medium, large, x-large. They are made with a smooth finish, which reduces sticking while gripping objects, such as surgical instruments. 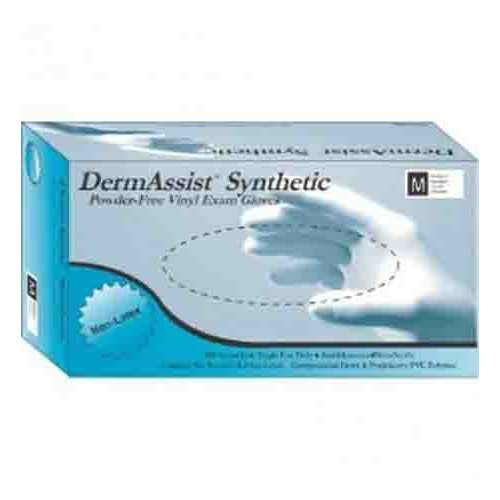 DermAssist Gloves comply with ASTM standards (D5250, D151, F1671). They have a fingertip thickness of 0.13 mm, palm thickness of 0.1 mm, and are designed for single use. These Exam Gloves are ambidextrous, powder free, and latex free. Note: The DermAssist Series Gloves are not chemo approved. However, Vitality Medical does offer gloves that are chemo rated, such as the Confiderm Chemo Rated Nitrile Exam Gloves and the Flexam Nitrile Exam Gloves.